I rarely use the system menu to start applications. I use keyboard shortcuts instead. Keyboard shortcuts are convenient time savers. To configure the shortcuts I use gconf-editor or CompizConfig Settings Manager (if I have Compiz turned on). Lately I've been using Chromium as my browser. Since Chromium is under heavy development it occasionally becomes unusable and I have to switch back to Firefox. I was hard-coding the browser command in my keyboard shortcuts. This became problematic with frequent browser hopping. I now use the xdg-open command when defining my keyboard shortcuts. xdg-open opens a file or URL in the user’s preferred application. 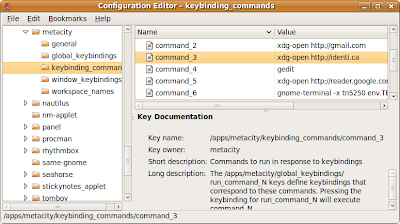 Below is a screen shot of my keyboard shortcuts defined in gconf-editor on Ubuntu Juanty 9.04. 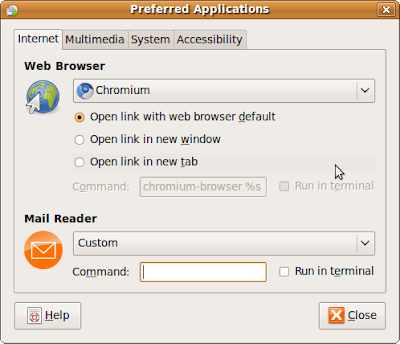 Now when switching browsers I don't have to update each keyboard binding command I just change my default browser in Ubuntu by clicking through the menu: System / Preferences / Preferred Applications / Web Browser. xdg-open is more convenient for this browser hopper.